On 29.02.2012, Tiémoko Konaté of Africa Sports made his debut for the Elephants, the Ivory Coast national football team, in a friendly match against Guinea. It is quite rare that an outfield player from the local league gets a chance at the Ivory Coast national football team and Konaté got a few headlines. It should be noted that the Elephants missed several top stars, but the squad still included quality players such as Siaka Tiéné, Abdul Kader Keita, Cheick Tioté and Gervinho. Konaté played a few minutes, replacing Gervinho during extra-time. The squad also included midfielder Dalla Coulibaly (born 28.05.1987), the captain of Africa Sports and the teammate of Konaté, as well as left-back / central defender Zahui Okou (born 11.06.1988) of ASEC Mimosas. However, it was only Konaté who got playing time on the pitch. Konaté joined Africa Sports, the champions of the Ivorian Ligue 1 2011, in early 2012. Konaté played for second level side EFYM during the Ivorian Ligue 2 2011. EFYM stands for “Ecole de Football Yéo Martial”. The club is based in Abidjan, the largest city in the Ivory Coast, and eventually won promotion to the Ivorian Ligue 1 2012 after a successful season. Konaté had a wonderful time at EFYM, becoming the official “Meilleur Joueur” of the Ivorian Ligue 2 2011. In other words, Konaté was regarded as the best player of the league, and his performances attracted several big teams in the country. I guess the chance of playing in the 2012 CAF Champions League was one of the reasons why Konaté decided to join Africa Sports. 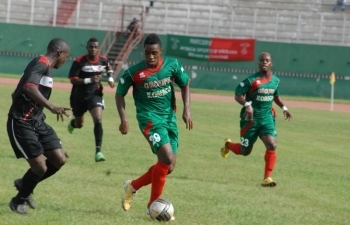 In February 2012, Konaté starred for Africa Sports in the preliminary round of the 2012 CAF Champions League, as well as in the “Supercoupe Houphouet-Boigny” against ASEC Mimosas. Konaté is no stranger to top level football in the Ivory Coast. He was part of the EFYM-team that played in the Ligue 1 2009, having a rather quiet time. Konaté is a quite versatile player. He has been described as a midfielder, an attacking midfielder, a right-winger and a striker. He is apparently a very skillful player and a great dribbler. According to Wikipedia, Konaté is born 03.03.1990. However, no source is given and it’s therefore difficult to know whether this is correct. The last couple of months have been like a fairytale for Konaté and this is obviously a player to watch for the up-coming Ligue 1 2012. Africa Sports will open their season against USC Bassam on 07.03.2012, most likely with Konaté as a creative force in the line-up. The picture is taken from http://www.fif-ci.com/.